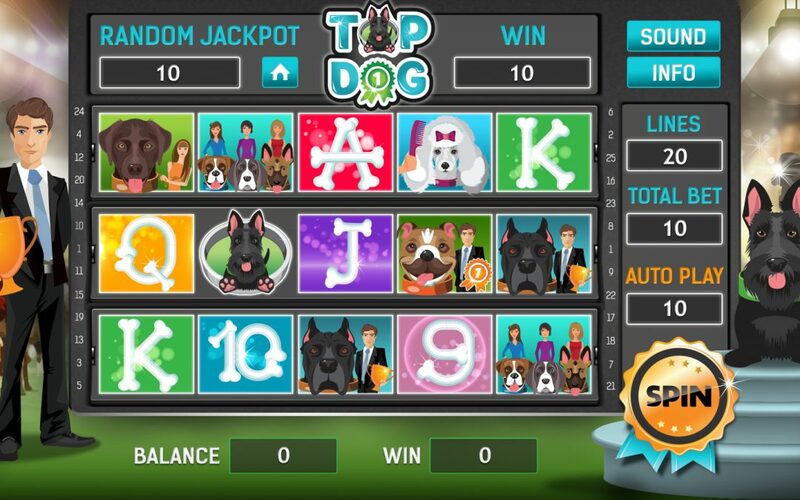 TopDog is one of our favorite online slot projects. Not just because we are puppy lovers, but also because every member of our team is more than excited to have the opportunity to claim responsibility for the infamous question from the 00’s song of Baha Men. Yeah, exactly the same song you heard on that funny scene in The Hangover. But enough about our pop culture fainting. We have other words of greatness to share about this project. It features one extremely sweet Scottish Terrier with pink tongue as a main character. He is accompanied by Cane Corso, German Shepard, Poodle, Chocolate Labrador, Bull Dog – all of them are going to be met later in the gaming process. The key purpose of our work over the design of the characters was to make them friendly, sweet and differentiate them according to the breed they represent. The happy look of the Chocolate Labrador, the resting look of the Cane Corso, the sloppy face of the Bulldog or the vanity of the Poodle – the necessary features for breed distinctions are all in, presented through a minimalistic approach. One will definitely have fun with this online slot game even when the results are not as exciting as expected. We are showcasing this project in our iGaming portfolio, because it represents one very important aspect from the iGaming field – the developing of casino games with emotional appeal to the players. Emotion is a strong asset and arming your iGaming business with it is something we’re fully prepared to help you with. Check up the complete portfolio with the work we have done and keep doing for other iGaming companies here.